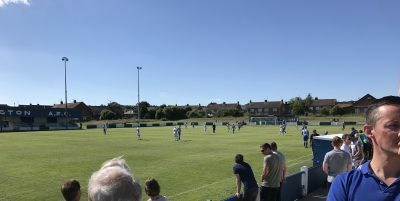 The Two Blues started their pre-season campaign in glorious sunshine at Hall Lane the home of Willington Town. Bishop gave debuts to Luke Gilhespy, Ben Trotter and Matty Moffat. Before the match a new area of terracing was opened in honour of Jackie Foster a great servant to both Willington and Bishop. Bishop dominated the early stages of the game without really threatening the Willington goal, on 12 minutes the Blues forced numerous corners. The first chance to note was on 29 minutes when Ben Riding rose the highest in the Willington box and headed just over the Willington crossbar. On 41 minutes just before half-time young Adian Hart forced Lewis Graham in the Willington goal to make a smart stop. Shortly after half-time the Willington number 9 hit a thunderous shot in to the side netting of the Bishop’s goal. It was only a matter of minutes after when Matty Moffat opened his goal account at the Bishops to put the Blues in to a lead that was deserved on the balance of play. On 55 minutes the ever-threatening Michael Hoganson flashed a shot just past the right-hand post of Willington’s goal. Griffiths then struck the Willington crossbar with the Willington goal keeper stranded, numerous changes were made through-out the second half. But it was on 84 minutes when Michael Hoganson got forward and got the goal he deserved to put Bishop Auckland 2 – 0 to the good. Two minutes later sub James Fairley hit the right-hand post of Willington’s goal, but he was not to be denied his goal when in the close seconds of the game he added Bishops third. 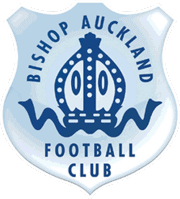 All in all, a good workout for Bishop against a Willington side who put up a good display and will do well in the Northern League 2nd division this season. Thank you for the hospitality and best of luck for the rest of the season. For Bishop, more difficult opponents to be faced in coming weeks but good to get off the mark with a win and a clean sheet. Our next game is the short journey to Crook Town this coming Wednesday night.